In the Russian Federation live 130,7 thousand of the Georgians. They are the indigenous population of Georgia. Georgian language belongs to the Kartvelian groups of the Iberian-Caucasian family of languages. The majority of Georgians is the Orthodox by the religion (Georgia adopted the Christianity in the first half of 4th century AD) and the Adzharians and the Laszy are the Moslems. The Georgian language has the writing and the rich literature since 4th century AD. The Georgians has the book printing since 1709. 3 large closely related ethnic groups formed the Georgian people: the Karts, the Megrelo-chans (Zans) and the Svans. The united Georgian nationality began to form during the first millennium BC. At this time there were large tribe associations (Diaokhy, ��lkhy), which, however, because of absence of strong economic relations were unstable. Inhabited and defensive towers, arable instruments of archaic forms, and also vestiges of blood feud, ancient religious representations could be found in the mountain regions in the 19th century. 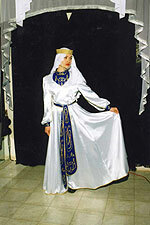 There are the following ethnographic groups of the Georgians: the Kartlians, the Kakhetinians with the Ingiloitians, the Kizikhs, the Tushins, the Pshavs, the Khevsurs, the Mtiuls with the Guda-Makars, the Mokhevs, the Imeritins, the Rachins, the Lechkhums, the Svans, the Megrels, the Laszy, the Adzharians and the Gurians. Georgia joined Russia in 1801-10. That promoted the development of capitalist relations and the further consolidation of Georgian nation. The Soviet Power was established in Georgia in February 1921.